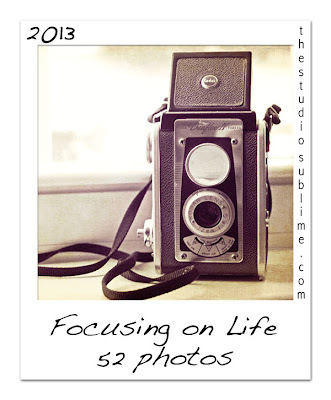 MiShel Designs: Focus on Life: 52 Photos - Week 10 - All Wrapped Up! Focus on Life: 52 Photos - Week 10 - All Wrapped Up! 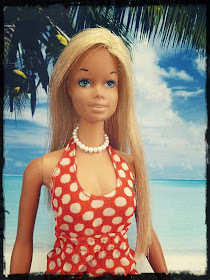 Sally's prompt was "All Wrapped Up"
I truly love these challenges each week! I normally wouldn't. They make me aware. "Wrapping" going on in my life! 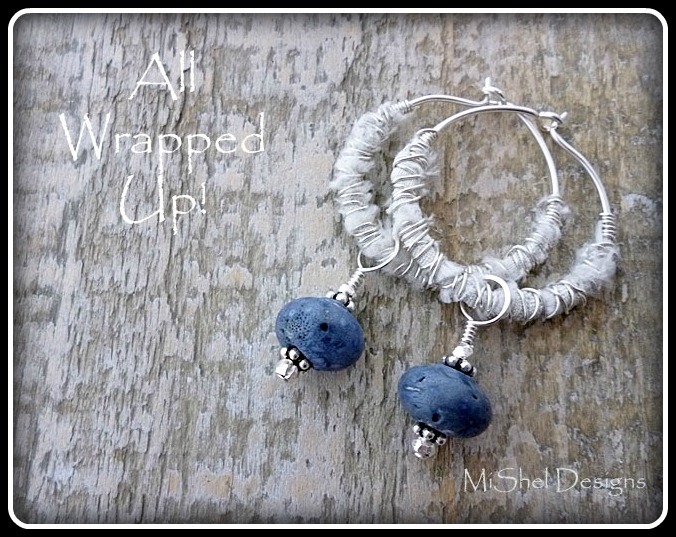 There was the wire-wrapped jewelry I created this week. There's the blanket I 'wrap' up in each night as I sit with my hubby and son and there were the yummy burritos we 'wrapped up' and ate one night. There were findings/accessories projects that I 'wrapped up' (finished) and then 'wrapped up' (literally) and shipped off this week. Yep, that pretty much "Wraps it up"! have "All Wrapped Up" for the week! Peace, Love and Happy Wrapping! *To all of you who have left such wonderful comments on these posts each week, I cannot begin to express how much your words mean to me. Your wire work is beautiful and so appropriate for this weeks prompt. I love the herringbone wrap..such a fun one to do! And it always gets comments too! And you are giving me some hoop design ideas too! Have a great week! I love the herringbone wrap, too Stacie and I can't seem to stay away from hoops, either!! ha! that is a lot of wrapping!! and beautiful wrapping at that! 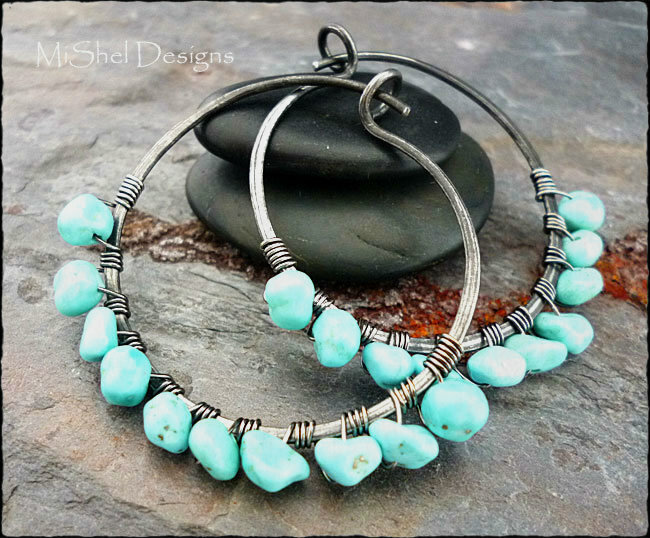 what gorgeous earrings (as always) Shel! That last pair is so cool how you wrapped fabric on the hoop - love that! 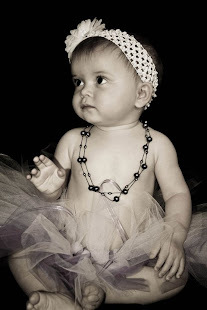 Beautiful jewelry and beautiful photos. You certainly have this 'wrapping'concept down pat. I love silver, too! Thanks for the compliments on my pics!! Pretty! I thought of wire-wrapping, too, but didn't have wire with me. Love them all, but maybe the last one a wee bit more. Great interpretation and your wire wrapping is beautiful. Great pieces! That's a lot of wrapping! Thank you - I sure did have fun! Beautiful creations, the first one is stunning! Thanks Adrienne - I really appreciate that! Lovely pieces (and pictures): I love the herringbone with that deep blue; and the fabric wrapped on the circles it's such a neat idea! Thanks so much Alicia! The fabric on those hoops is recycled sari silk ribbon. It's really fun to work with! Great post! You were wrapped up in many things this week! And the earrings are just gorgeous! Sign me up as sucker for herringbone too, just so pretty. You've got just beautiful pictures here, as always! Thanks so much!! I do love the herringbone weave,...both how it looks and doing it - it's just fun! All that awesome wrapping had me beatboxing while I was reading! =) You have mad wire wrapping skills Shel ... I love your designs! Awesome post! And as usual, your work is divine! Lovely earrings... think I like the tird pair the best. Are they dyed blue coral? I have some but yours is a much prettier colour! I'm surprised at how few people showed themselves wrapped up in front of the TV or reading! They were labeled as 'blue lava stones' when I purchased them and I too thought more people would be wrapped up in books, seeing how we all seem to love to read!! And of course,,...the t.v., too!! 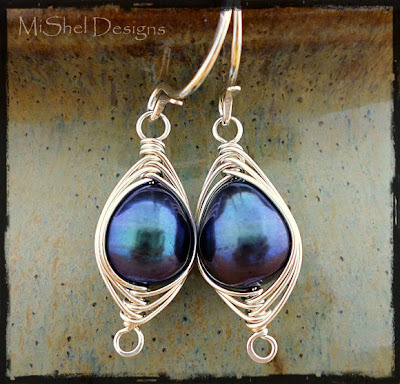 Beautiful Wirework Shel. Good job finding so many wrapped up things this week. Thanks Becky - I did find a bunch of stuff to wrap my brain around, that's for sure!! Perfect examples of "all wrapped up." 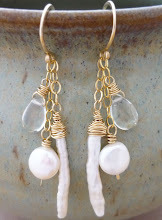 And gorgeous earrings to boot!